Our Abpromise guarantee covers the use of ab50609 in the following tested applications. WB Use a concentration of 0.5 - 1 µg/ml. Predicted molecular weight: 70 kDa. Immunocytochemistry/ Immunofluorescence - Anti-NXF1 antibody [53H8] (ab50609)This image is courtesy of an Anonymous Abreview. ab50609 staining NXF1 in HeLa cells by Immunocytochemistry/ Immunofluorescence. Cells were fixed in paraformaldehyde and permeabilized in 0.1% Triton X-100. The primary antibody was diluted 1/1000 in 3% BSA in PBS and incubated with the sample for 1 hour at 25°C. The secondary antibody was Alexa Fluor® 568-conjugated goat anti-mouse polyclonal, diluted 1/1000. 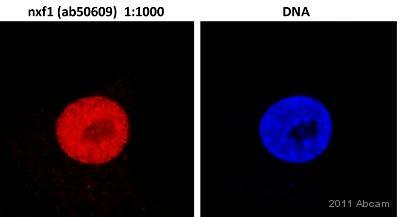 DAPI was used for nuclear counterstain.